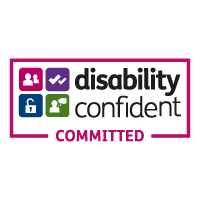 Venesky-Brown are proud to be recognised as a Disability Confident Committed employer. The Disability Confident scheme supports employers to make the most of the talents disabled people can bring to your workplace. The scheme aims to help you successfully recruit and retain disabled people and those with health conditions. This entry was posted in Uncategorized on October 17, 2018 by Hannah Smiley.